PARIS, Jul 16, 2014/ — Everyone has heard of “red carpet dressing” but have you heard of literally “dressing with the red carpet”. 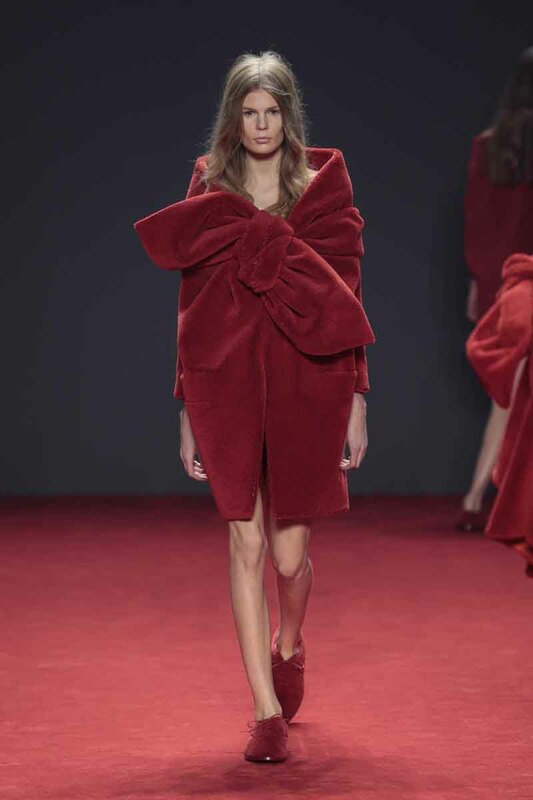 With tongue-in-cheek, Viktor & Rolf created their Fall 2014 haute couture solely using Desso carpets, in red of course! Desso, the global carpets, carpet tiles and sports pitches company contributed to Viktor&Rolf’s Fall/Winter 2014 Haute Couture collection – which was presented at the Paris Fashion Week on July 9th- by delivering red carpet material and supporting the finishing. The designs allude to the spontaneous gesture of primitive clothing construction – asymmetric, wrapped, knotted – while blending into classic couture references. Animal skin motifs – leopard, zebra, and giraffe – are executed in shaved and laboriously hand-appliquéd carpet, which takes up to 300 hours per look to complete. The collection forms a surreal reference to fur as camouflage; as an ancient indigenous clothing material, as well as to animal print as the archetypal epitome of glamour. “For Desso the exciting collaboration with Viktor&Rolf suits perfectly with our design vision. We want to stimulate co-creation with leading designers and use the power of creativity to find inspiring new ways to use carpet”, says Alexander Collot d’Escury, CEO Desso. The event was hosted at La Gaite Lyrique, 3 bis Rue Papin 75003, Paris on Wednesday July 9th at 8:00PM.